–MANY writers have remarked on an overall drop in blog readership. This blog is no different and reflects the trend. Since May 2007 unique views have dropped nearly 50% from a peak of 17,000 monthly views. Interestingly, my views on my Youtube channel have remained constant despite not adding much content since I got banned. I recently became aware of a new technology with the potential to revitalize sagging blog readership. The tech firm SpeechKit provides text-to-speech conversion to embed into a blog. This would allow artists to listen to the blog while pursuing other tasks. Currently, they only allow embedding in WordPress blogs but are working on universal compatibility–including Blogger. Since I don't have a WordPress blog, I can't currently provide audio capability for my content. But these two sites have converted content you can listen to: Here is my interview concerning the meaning of my graphic novel Cypher. 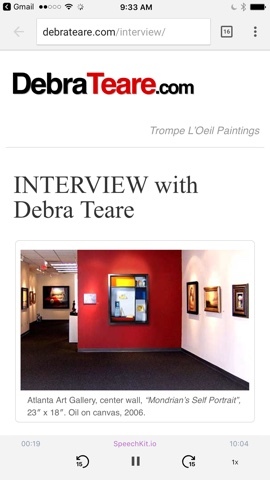 Here is an interview with my wife, Debra Teare, who paints trompe l'oeil paintings. If you are an enthusiast of realist painting you should give her interview a listen. In the first example, the player is embedded in the copy at the head of the page. In the second example, the player is viewable at the bottom of the page and maintains its position despite scrolling. Both variations work well on my iPhone. I think I prefer the second variation but let me know of your experience. Also, there are anomalies, which are typical of AI narration, like the drop caps not being pronounced, and a few other oddities. But overall I think the technology is quite good and much better than any alternatives I've tried. Let me know what you think. Really very interesting and very valuable information about the Art Instruction well done. I search many blog about the art gallery but did not get many specific detail about the this topic but your blog have allot of information about my topic which I always searching. A very interesting information about the art and design that i got from here thank you for this blog.